Alan D. Percy, Senior Director of marketing at AudioCodes, recently wrote about the upcoming brand change of Microsoftâ€™s Lync communication service to â€œSkype for Business,â€ which acknowledges the broad brand recognition of Skype compared to the Lync service. For everyone in the telecom business, bringing better communications to business is an important consideration. Skypeâ€™s ease-of-use and wide adoption by consumers could make the new business version the defacto online business communication tool for everything from collaboration to customer service. Microsoft promises that all of Lyncâ€™s features will remain, but integration with Skypeâ€™s contacts and an interface reminiscent of Skypeâ€™s user interface will be new. From a brand standpoint, the move certainly makes sense; but what of the perception by many current users that Skype is a free service? What features will make Skype for Business valuable enough for companies to shell out real dollars? So far Microsoft hasnâ€™t communicated fully what extra features will be included with your subscription although they have mentioned better cloud functionality. Percy goes on to wonder about some of the current hassles with using Skype, such as receiving unwanted solicitations. In a customer service setting where responding to legitimate customer needs is a priority, how will Skype for Business allow companies to filter out the solicitations from the real customers? Weâ€™ll have to wait and see on this point, but if a sound solution is forthcoming from Microsoft, Skype for Business could well become the dominant player in person-to-person business contacts over the next year or two. Dave Michels of UCS Strategies points out several positive aspects to the planned change, as well. 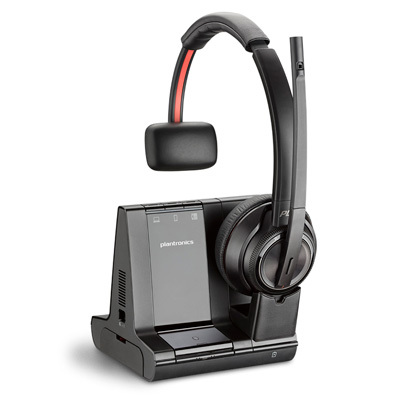 The right headset can enhance your Skype experience, and we recommend the PlantronicsÂ Savi 400Â series wireless PC headset. It operates in the voice only 1.9 Ghz spectrum, so you get excellent, encrypted sound. Â Savi 400 wireless headsets come with a high-quality travel case for working anywhere. If you download the latest release of Plantronics Hub software (free) youâ€™ll have one-touch call answer/end capability. When a call comes through Skype, it will notify you on the headset and all you have to do is press the answer button on the earpiece.